Windjammer is a, four-bedroom, three-bath oceanfront cottage, and it just might become the centerpiece of your family’s beach tradition. This vintage charmer sits just steps from the beach. 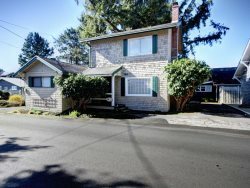 Sweeping views of the Pacific and Haystack Rock will delight you ….. The original stone fireplace and knotty pine walls will welcome you to this timeless home. Built in 1939, Windjammer has seen additions and conversions along the way, leaving a unique home filled with enough nooks and crannies throughout to delight and accommodate even a large family. The generous living and dining areas feature a wall of windows focused on breathtaking views of the Pacific Ocean and Haystack Rock. The casual, living room is filled with comfortable seating, and there is a large, flat-screen TV for movies or the big game. On the days and nights when the sand beckons you to the beach for tidepooling, bonfires or simply relaxing; head out your backdoor. A shared staircase with 21 steps will lead you to the sand. A patio and private yard provide you with ample seating, a gas grill and plenty of space for the kids – and dog – to run! Two steps down from the living room will lead you to the master suite featuring a king sized bed, flat screen TV and private bathroom with a tub and separate walk-in shower. Down the hall from the master suite, you will discover a hallway leading to an east set of stairs that will take you to a 15+ foot-long dormer, with four twin beds . This room, with it’s own staircase, makes an ideal spot for afternoon naps or for the kids to indulge in slumber parties and ghost stories. A complete, yet cozy, kitchen is available for fixing a full meal or packing up picnic lunches to take to the beach. If you decide to take your morning coffee in, the kitchen’s ocean front eating nook provides a perfect opportunity. Through the kitchen on the east side is a laundry room with a 3/4 bathroom. Wind your way through the kitchen and living rooms to the west side of the house, and you will find a second staircase leading to two more bedrooms and bath tucked into the dormers on the second floor. Wake to a full view of the ocean and Haystack Rock from the first bedroom with a queen-sized bed and flat screen TV. The second bedroom is a delight, from the angles of the ceiling to the northwest views of the water and Tillamook Head Lighthouse. A full bathroom, located between the two bedrooms, is perfect for sharing. This rustic, beach home is as unique as it is charming and comfortable. The classic feel of this house will evoke memories of a simpler time and place. This simple, yet coveted, home has been the backdrop for years of family memories. Bed Configuration: one King, 2 Queens, and 4 twin beds. Cannon Beach Vacation Rentals also has these homes close by: Sandpiper #388, Seahorse #380, and Lighthouse #301. Very pleasant stay. The home was equipped with everything needed. Older home, but very very clean. Have always found your company pleasant to deal with, well organized and attentive. Cannon Beach is a favourite destination. I found your company very responsive, accommodating and very easy to deal with. We really enjoyed our stay. The house was quirky, but fit our needs perfectly and we had such a good time we re-upped for next year. The house was very clean and we appreciated the welcome bag. Our requests were taken care of quickly and efficiently. Everyone was super helpful and friendly. Loved staying here - was clean and beautiful and plenty of room for the eight of us plus a baby. The beach access was private and while the stairs are steep, it was lit up well and easy to get up and down even at night.